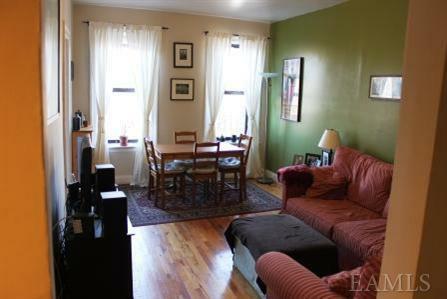 Here is a great two bedroom one bath in excellent condition overlooking Pelham Parkway. It was just listed so please call if you want first dibs on it! Interest rates are low and prices are reduced in today's market. Besides the essentials below, I posted four photos for your review. My contact information can be found at the bottom of the post. This one will go quickly. 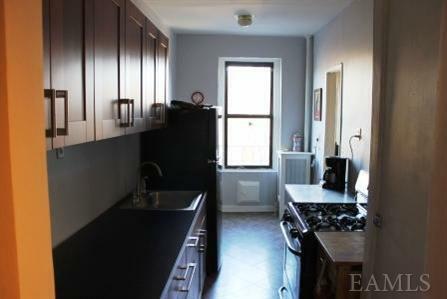 "Sunny, pet friendly 2 bedroom co-op in well maintained elevator building. 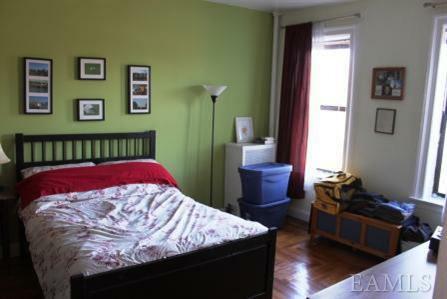 Unit overlooks Pelham Parkway. Trees outside every window! Walking distance to everything including #5/#2 subway lines, various NYC bus lines and Express Bus line for quick access to City. Great food shopping on Lydig Avenue and great commercial strip on White Plains Road. 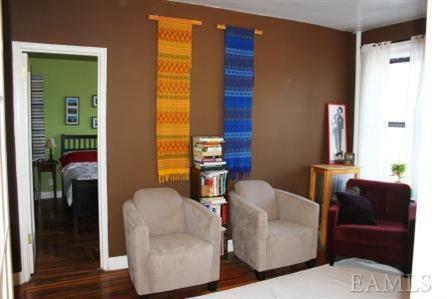 Spacious rooms with great hardwood floors and tall ceilings. Parking available but there is a wait list. High owner occupancy and good financials." Labels: "2199 Holland Avenue", "Bronx Co-ops", "Co-ops for the 99%", "two bedroom co-op"
Labels: "BOEDC", "Bronx Borough President Ruben Diaz Jr.", "Bronx County Holiday Stree Lighting Ceremony", "Bronx Tourism Council", "Christmas Carols", "Dominos Pizza", "Santa Clause"
For anyone wondering where the "Occupy Wall Street" movement is “going” please note news received from Boogiedowner readers about Fordham University's first 99% Club meeting. Over 30 people representing faculty, students and alumni were in attendance. Their planning on having their next meeting at a larger venue to accommodate a much larger anticipated attendance. There also advocating for “99% clubs” to spread world wide. I posted the goals the Fordham University arm expressed to date for everyone to see where this segment of the movement is going. If interested in attending their next meeting I am told they established their own facebook page. I am curious to see if or how the movement will get involved in electoral politics. There are already interesting e-mails being sent related to this topic on both sides of the issue. What are your ideas on this issue? Good Luck to all the activists. 1. To disseminate accurate information about the Occupy movements in the US and around the world. 3. To organize around economic inequality issues and threats to freedom of expression where you live and/or where you work. 4. To create networks among people who support the Occupy movement that enable them to mobilze support for demonstrations organized by that movement. The strength of these clubs is that they allow people a wide variety of situations , including those who are homebound or disabled, to participate in the Occupy movement. Labels: "99% Clubs", "Fordham University", "Occupy Wall Street", "Social Movements"
Here is news on another free holiday event taking place in the Bronx. They will be accepting donations however, to help replace their organ. An invitation to another Christmas concert . . . This will be a lovely, short, concert, to raise money for the Church’s organ, which needs to be replaced. Sunday, December 4, 2011 at 2:00 p.m. Admission is free, and the artists encourage donations to the Organ Fund for Visitation Church. Labels: "Becilia Wong", "Christmas Concert", "Church of the Visitation", "Evertt Suttle", "Manhattan College", "Santa and Mrs. Clause"
Here is news on free workshops that should help young artists and entrepreneurs. If you’re an artist or entrepreneur building or maintaining a web site the knowledge provided at the seminars should be extremely helpful. For additional information on this workshop or other events presented by the Bronx Council on the Arts, call 718-931-9500, e-mail info@bronxarts.org, or visit BCA’s web pages at www.bronxarts.org. Here is news on free workshops that should help young artists and entreprenuers. If your an artist or web developer the knowledge provided at the seminars should be extremly helopfull. Labels: "Bronx Council of the Arts", "Dwyer Cultural Center", "Fitzpatrick, "Free", "Intellectual Property", "Legal Aid Society", "The Harlem Arts Alliance", Cella Harper and Scinto"
Here are some turkeys that survived another Thanksgiving day in the Bronx. They can be found on the grounds at the New York Botanical Garden. I usually see them by the book/gift store as you enter the main entrance. 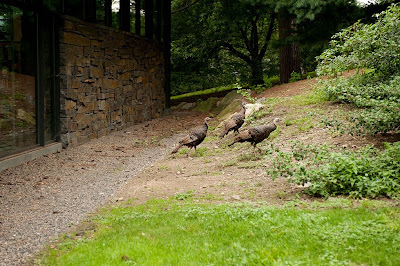 It’s amazing to see what wild turkeys look like compared to the ones bread for eating. I bet these turkeys can actually fly a few feet. Labels: "Ivan M. Vermeulen", "NY Botanical Garden", "Thanksgiving", "Wild Turkeys in the Bronx"
Hunts Point youth Victor Davila was one of seven winners of the 2011 Brower Youth Awards. He was honored for founding the environmental stewardship program called EcoRyders. His organization uses skateboarding to teach young people about environmental and health issues in the neighborhood. His attitude is truly exceptional. To review the full article click on the "Hunts Point Express" link on the right. Kudos to the exceptional young man. Labels: "Hunts Point", "The Point", "Victor Davilla"
Three classical music concerts are planned by the Bronx Arts Ensemble for the Holiday Season. Besides the quality concert anticipated, I am impressed with the locations selected. All three concerts will take place in historic homes located in the North Bronx and South Yonkers. The concerts should be both an acoustics and visual treat. To secure tickets please call the phone # below or just send a self addressed envelope with postage to the following address. Please note there is a 5 ticket limit per request. (Bronx, NY) - Bronx Arts Ensemble opens the holiday season with St. Nicholas Celebration concerts on Saturday, December 3 at 1 pm and 3 pm at Philipse Manor Hall at 29 Warburton Avenue at Dock Street, in Yonkers and Saturday, December 10 and Sunday, December 11 at 1 noon and 3 pm at the Bartow-Pell Mansion on Shore Road, Pelham Bay Park, near the Split Rock Golf Course. The St. Nicholas Celebration by the BAE Singers and Double Reed Band (oboe, oboe d'amore, English horn and bassoon) describes in song and storytelling the arrival of the Dutch sinterklass, who brings candies and fruits to good children of colonial New Amsterdam, and lumps of coal to those who have misbehaved. Following the program, which includes many old Dutch carols, the audience will join with the group in singing holiday songs. Fun for the whole family! Free tickets are available by calling the BAE at 718.601.7399. Orders are limited to 5 tickets per person, as seating is limited. Visit www.bronxartsensemble.org for more information on upcoming events. Labels: ", "Bronx Arts Ensemble", "Free Classical Concerts", "Old Dutch Carols" "Bartow-Pell Mansion", "Philipse Manor Hall", "St. Nicholas Celebration"
Here is another Thanksgiving related post. Kudos to Western Beef for their generous contribution of 2,500 free turkeys to Bronx families this Thanksgiving. 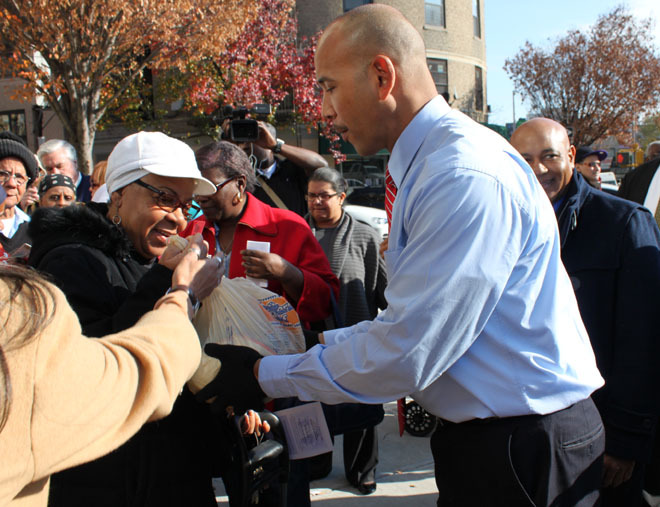 On Monday, November 21, 2011, Bronx Borough President Ruben Diaz Jr. teamed up with Western Beef for the company’s annual giveaway of 2,500 free turkeys to Bronx families in need. Borough President Diaz participated in the turkey distribution at the corner of West Burnside Avenue and Grand Avenue, where more than 400 free turkeys were given away to residents. Borough President Diaz will give away hundreds of free turkeys as part of his annual turkey giveaway at various locations in the Bronx throughout this week. Labels: "Annual Turkey Give Away", "Bronx Borough President Ruben Diaz Jr.", "Free Turkeys", "Western Beef"
If you can't afford to heat your home, please review the following information sent by Councilman Koppell. There might be help available through the Federal Home Energy Assistance Program. Please forward this e-mail to anyone you know who might need the extra help to stay warm this winter. Council Member Oliver Koppell has announced that the Home Energy Assistance Program (HEAP), a federally-funded program to assist people on low or fixed incomes pay for their winter energy bills, is now accepting applications for the 2011-12 season. HEAP may help you pay for electricity, gas, oil coal, propane, wood/wood pellets, kerosene, corn and may be available even if your heat is included in your rent. You may also be eligible for a regular HEAP benefit even if you have money in the bank, stocks, bonds or other resources. If you have an energy emergency such as a power shut-off or less than a quarter tank/ten day supply of heating fuel, you can apply for a HEAP emergency benefit. This is in addition to your regular HEAP benefit. Applications for HEAP are available in Koppell’s district office, 3636 Waldo Avenue Bronx/ Riverdale. For more information, you may call the office at (718) 549-7300 or the Toll-Free Hot Line at 800-342-3009 or visit www.otda.state.ny.us and click on “Resources for Working Families“. “ I would like to encourage people who need help with their energy bills and believe they are eligible for the HEAP program to apply as soon as possible because funds are limited,” Koppell said. Labels: ", "HEAP PROGRAM", "Home Energy Assistance Program", "NYC Councilman Koppell"
Labels: "Happy Thanksgiving", "Obama", "Presidential Pardon", "Thanksgiving"
The following video has gone viral and been viewed over 1,690,000 times. If you have not already seen it on various local news stations please do take a moment to view it by clicking the play button below. The video shows a police force pepper spraying college students as if they were roaches while they peacefully protesting at UC Davis. Since when have police had the authority to spray chemical agents on peaceful college students during a demonstration? The officers in this video embarrassed themselves, their university and our nation. We were once seen as a nation that honored and protected civil rights. We were a worldwide symbol of justice. The police officers shown pepper spraying college youth and everyone that gave them the authorization must be held accountable. I understand police are in a difficult position but this is insanity and must be stopped! Thank God we don't have these clowns as our police force in NYC. Labels: "Excessive Force", "Police Brutality", "Police Pepper Spraying Students", "Students Protests", "UC Davis"
Various elected officials showed their support for unionized labor recently by joining Verizon workers at a rally. Elected officials present were Assemblyman Dinowitz, State Senator Gustavo Rivera, Council Member Fernando Cabrera, and Assemblyman Michael Benedetto. Labels: "Assemblyman Dinowitz", "Councilman Michael Benedetto", "Councilmember Fernando Cabrera", "Rally", "State Senator Gustov Rivera", "Verizon"
Here is news on Latino cultural events coming up in early December. The events should be a great way to enjoy the holidays with family and friends without breaking the bank. Please make sure to log onto to the Casita Maria Center for Arts and Education web site listed below for additional information. With the goal of highlighting the cultural diversity of our community, while showcasing a shared folklore and tradition in performance, Diversity in Arts and Nations for Cultural Education, Inc. (DANCE), presents the second annual South Bronx Folk Festival - a week of cultural events open to the public at various venues in the South Bronx. Caracumbe showcases a musical heritage of distinctive African roots found in a Peru mostly known for its Native American and European influences. Caracumbe showcases a musical heritage of distinctive African roots found in a Peru mostly known for its Native American and European influences. Calpulli celebrates the rich, regional dance traditions of Mexico’s diverse cultural history interpreted through its unique artistic vision. The fresh, vital repertoire honors Mexico’s past and immigrant life in the United States. Bámbula's mission is to not only entertain as a musical group but to also help preserve the culture of the African traditions brought to the island of Puerto Rico by the Slave trade. Labels: "Bambula", "Calpulli Mexicana Dance", "Casita Maria Center for the Arts and Education", "Danza Fiesta", "South Bronx Folk Festival", Caracumbe"
The Albanian-American community is celebrating its 99th anniversary from Ottoman occupation on Saturday, November 26th. The following about their history and Saturday's event was sent by the Albanian-American Community Association. Kudos for their example on how we should all honor our heritage and keep our unique traditions alive. by the Albanian national hero, Scanderbeg. background – was raised, and over 500 years of foreign rule was ended. and our shared ideals of freedom and liberty. When: Saturday, November 26, 2011 @ 11:00 A.M.
What: Flag Raising to celebrate the 99th anniversary of Albanian Independence. young Albanian-Americans dressed in traditional Albanian clothing. Labels: "AACA", "Albania", "Albanian American Community Association", "Albanian Independance Day", "Illyrians", "Mark Gjonaj", "Mother Teresa", "Scanderbeg"
The Fordham Road Business Improvement District (BID) is proud to announce that their Seventh Annual “Sparkling the Heart of Fordham” Holiday Lighting Ceremony will take place on Friday, December 2, 2011 from 6PM-8PM. The festivities will begin with their annual lighting ceremony in Bryan Park at East Fordham Road & East Kingsbridge Road. A musical performance a visit from Santa Claus, holiday music and free gifts for children will also be part of the festivities . Labels: "Bryant Park", "Fordham Road BID", "Free Gifts for Children", "Holiday Music", "Santa Clause", "Sparkle the Heart of Fordham"
As our media becomes increasingly owned by big corporations, it's good to see that local investigative reporters are being awarded by organizations promoting investigative journalism. Kudos to New York Civic and the reporters honored by them. The good government group New York Civic announced the winners of its inaugural investigative journalism fellowships today, selecting Laura Nahmias, a reporter for The Capitol and City Hall, as the first recipient of its Mary Perot Nichols Award. Nahmias, who was chosen from dozens of applicants, won for her article “Boyland’s Magic Trick” in the September 26th, 2011, issue of the Capitol, which uncovered several instances where Assemblyman William Boyland Jr. claimed reimbursements for working in Albany, when in fact, as Nahmias proved, he was nowhere near the state capital at the time. As the recipient of the Mary Perot Nichols Award, which is named in honor of the late muckraking Village Voice columnist and WNYC president in the Koch administration, Nahmias will receive $2,000 at a ceremony to be held later this month. Aaron Short, a staff reporter for The Brooklyn Paper, will also be honored with a $1,000 prize for his article titled “This is supposed to be a senior center. It’s actually Vito Lopez’s clubhouse”, which appeared in The Brooklyn Paper and The New York Post on October 30th, 2010, and is part of Short’s ongoing investigation into the Ridgewood Bushwick Senior Citizens Council nonprofit organization and its founder, Brooklyn Democratic Party boss Assemblyman Vito Lopez. Laura Nahmias, 27, has been a staff reporter for City Hall and The Capitol since July 2010. A graduate of Wesleyan University and Columbia University’s Graduate School of Journalism, Nahmias began her career covering local government for The Island Packet, a community newspaper in Beaufort County, South Carolina. A native of Memphis, Tennessee, Nahmias’s writings have covered a broad array of subjects, ranging from politics and history to pop music, golf, and alligators. Aaron Short, 30, has been a staff reporter for the Community Newspaper Group-owned Brooklyn Paper, a subsidiary of Rupert Murdoch’s News Corporation, since November 2007. Originally from Storrs, Connecticut, Short graduated with honors from the University of Pennsylvania, before receiving his Masters in American History from Brown University. As well as writing for The Brooklyn Paper, he has contributed articles to the New York Post, Pennsylvania Gazette, and BushwickBK blog. In addition to the Mary Perot Nichols Investigative Journalism Award for New York State Reporters and Bloggers, New York Civic had also intended to present the Robert F. Wagner, Jr. Investigative Journalism Award for New York State Undergraduate Students and Murray Kempton Investigative Journalism Award for New York State Graduate Students, however, after reviewing all of the student entries, New York Civic determined that there were not any submissions worthy of the prizes. As a result, New York Civic will take the $3,000 allocated for student prizes and apply it to next year’s awards. Founded in 2002, New York Civic is a nonprofit, nonpartisan good government group that aims to advance political reform in the city and state of New York through education, community outreach, social networking, and grassroots activism. For more information about New York Civic, go to www.nycivic.org. Labels: "Aron Short", "City Hall", "Investigative Journalism", "Laura Nahmias", "Mary Perot Nichols Award", "New York Civic", "The Brooklyn Paper", "The Capital"
With Thanksgiving around the corner everyone should know about a bakery that makes exceptional cakes. Lloyd's Carrot Cake bakery is “a must go to spot”. All their cakes are made from scratch. If you want something special on your table during the upcoming holidays, I suggest you seek out this Bronx landmark. Everything they make is delicious and it's always served with a smile. I posted their web site address and text taken from it. "You have to get them to taste it. Once they taste it we're in." That was believed to be the key strategy to the success of Lloyd's Carrot Cake, according to the late owner and founder, Lloyd Adams. For over 25 years, the quaint but very well-known bakery has supplied the most delicious baked goods made from scratch, to numerous patrons in the tri-state area. Initially starting with a recipe given to him by his mother, Lloyd toyed around with the ingredients in his Harlem apartment; tweaking the recipe to his liking. After much trial and error, he finally made a recipe that was promising for success. In 1985, he had enough money saved up to open a store front in the quiet Riverdale section of the Bronx. Since then, Lloyd's has become a staple in the neighborhood and beyond, providing thousands of customers with some of the best homemade cakes, pies,and muffins in the city. The wholesome ingredients help provide an indescribable rich flavor that cannot be found anywhere else. Best-known for its carrot cake topped with its signature cream- cheese frosting, Lloyd's has also won customers with its red velvet, german-chocolate, and pineapple-coconut cakes; as well as its delectable sweet potato, pumpkin, and apple pies. After Lloyd's passing in 2007, his wife Betty continues to strengthen his legacy. With the help of their two children, Brandon and Lilka, and the tremendous dedication of their friendly staff, Lloyd's has never missed a beat. "I've always had the social-science view that I could change the world. To walk into a restaurant where a customer is eating a slice of cake and hear, 'Wow, who made this carrot cake?' That's what turns me on." Labels: "Betty Adams", "Bronx", "Carrot Cake", "German-Chocolate Cake", "Lloyd Adams", "pies", "Pineapple-coconut cake"
The Occupy Wall Street movement has sparked Bronx students to start an organization called The Dream Yard A.C.T.I.O.N. They created a list of demands which were e-mailed to the BoogieDowner. Their demands should spark discussion and then positive change in the NYC Public School system. It's good to know grass roots efforts are organizing to protect our public schools system. Hopefully the public will be more vigilant and prevent abuses like the latest fiasco where legislators classified pizza as a vegetable to increase pizza sales to public school. And then we wonder why we have an obesity problem in America!!!! Good luck to the student activists. 1. We demand free quality education as a right guaranteed by the US Constitution. 2. We demand the dismantling of Bloomberg’s Panel for Educational Policy. We demand a new 13 member community board to run our public schools (comprised of parents, educators, education experts, community members, and a minimum of 5 student representatives). 3. We demand quality instruction. Teachers should ethnically, culturally, and racially reflect the student body. We demand experienced teachers who have a history of teaching students well. Teacher training should be intensive and include an apprenticeship with master teachers as well as experiences with the communities where the school is located. 4. We demand stronger extra-curricular activities to help stimulate and spark interest in students. Students should have options, opportunities, and choice in their education. 5. We demand a healthy, safe environment that does not expect our failure or anticipate our criminality. We demand a school culture that acknowledges our humanity (free of metal detectors, untrained and underpaid security guards, and abusive tactics). 6. We demand that all NYC public school communities foster structured and programmatic community building so that students, teachers, and staff learn in an environment that is respectful and safe for all. 7. We demand small classes. Class sizes should be humane and productive. We demand that the student to teacher ratio for a mainstream classroom should be no more than 15:1. 8. We demand student assessments and evaluations that reflect the variety of ways that we learn and think (portfolio assessments, thesis defenses, anecdotal evaluations, written exams). Student success should not depend solely on high stakes testing. 9. We demand a stop to the attack on our schools. If a school is deemed “failing”, we demand a team of qualified and diverse experts to assess how such schools can improve and the resources to improve them. 10. We demand fiscal equity for NYC public schools: as stated in the Education Budget and Reform Act of 2007 by the NYS Legislature, NYC public schools have been inadequately and inequitably funded. We demand the legislatively mandated $7 billion dollars in increased annual state education aid to be delivered to our schools now! Labels: "10 Point Education Plan", "Jorge Rivas", "NYC Public Schools", "Occupy the Bronx", "Occupy Wall Street", "Panel for Education Policy", "The Dream Yard A.C.T.I.O.N. Project"
There is a free screening tomorrow of the documentary Big Pun The Legacy. FilmBuff and Urban Latino Magazine will co-host the event at The Point Cultural Center in Hunts Point. Their goal is to celebrate Big Pun’s incredible impact on hip hop and on the Puerto Rican community in the Bronx. 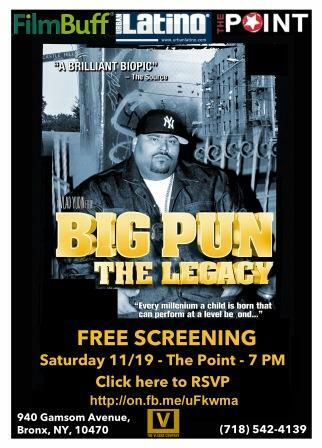 The film follows Big Pun’s life in the Bronx, his rise to fame and finally his sudden death leaving countless fans at a loss. The film also features today’s biggest hip hop stars, including Snoop Dog, Method Man and DMX The filmmakers will be in attendance and will answer questions from the audience. Labels: "Big Pun", "DMX", "Film Buff", "Hunts Point", "Method Man", "Snoop Dog", "The Point Cultural Center", "Urban Latino Magazine"
There is health fare tomorrow at the Kips Bay Boys club. If your elderly or one of America's uninsured, please do review the services available tomorrow. For anyone who has children, tomorrows events will be a great opportunity to visit and inspect the Kips Boy Boys Club. It truly is one of our boroughs success stories. Much of my youth was spent at the complex. They had a great swim program. On Saturday, November 19, Council Member James Vacca will sponsor a community health fair at the Kips Bay Boys & Girls Club Throggs Neck Unit located at 550 Balcom Ave (between Dewey & Schley Aves) from 11 AM to 2 PM. The event will feature free flu shots (first-come, first-served for adults 18 & over), blood pressure screenings, visions screenings, karate and Zumba demonstrations, entertainment, as well as enrollment information for Food Stamps, Medicaid, and WIC and much more. The event is co-sponsored by the Kips Bay Boys & Girls Club Throggs Neck Unit. Labels: "Entertainmnet", "Free Flu Shots", "Health Fair", "James Vacca", "Karate", "Kips Bay Boys Club", "Vision Screenings", "Zumba"
Bronx, NY – Nov. 17, 2011 – Winter is always a magical time in New York City and the Wildlife Conservation Society’s Bronx Zoo will be the highlight of the holiday season with family activities every weekend and throughout the week between Christmas Day and New Year’s Day. Guests of WCS’s Bronx Zoo can enjoy a nostalgic horse-drawn carriage ride around the zoo’s historic Astor Court. Guests of WCS’s Bronx Zoo will have the unique opportunity to watch as artists turn blocks of ice into glistening statues of a variety of animals. Guests of WCS’s Bronx Zoo will watch as ice carvers test their skills in a competition of creativity as they sculpt various animals out of blocks of ice. Giant Ice Throne and Display - This giant chair makes for the perfect photo opportunity for guests as they sit on the giant polar bear-themed throne and play among the mountains and ice burgs surrounding them. The ice slide kids will enjoy sliding down the 25-foot long slide carved out of solid ice through the sculptures of waves, palm trees, sea lions and dolphins. Island pieces and tunnels (for ages 4 to 6 years) – Younger kids will enjoy navigating the small tunnels, a miniature slide, and a small maze all carved from ice. Performance of If You Really Loved Polar Bears. Making Books Sing uses music, puppetry, and comedy to tell the story of a little boy who loves polar bears and the role we all can play in helping to protect them. Kids can meet Super WHY and his friend Alpha Pig from the hit television series on Sprout. The Wildlife Conservation Society’s Bronx Zoo is open daily from 10:00 a.m. to 5:00 p.m. weekdays, 5:30 p.m. weekends from April to October; 10:00 a.m. to 4:30 p.m November to March. Adult admission is $16, children (3-12 years old) $12, children under 3 are free, seniors (65+) are $14. Parking is $13 for cars and $16 for buses. The Bronx Zoo is conveniently located off the Bronx River Parkway at Exit 6; by train via the #2 or #5 or by bus via the #9, #12, #19, #22, MetroNorth, or BxM11 Express Bus service (from Manhattan that stops just outside the gate.) To plan your trip, visit bronxzoo.com or call 718-367-1010. The Wildlife Conservation Society saves wildlife and wild places worldwide. We do so through science, global conservation, education and the management of the world’s largest system of urban wildlife parks, led by the flagship Bronx Zoo. Together these activities change attitudes towards nature and help people imagine wildlife and humans living in harmony. WCS is committed to this mission because it is essential to the integrity of life on Earth. Labels: "Bronx Zoo", "Horse and Carriage Rides", "Ice Carving Competition", "Pepsi", "Sprout TV", "Theatrical Performances", "Winter Activities"
While home last night watching one sold out news correspondent after the other propagating ideas that destroy the American middle class, I came across an episode of Countdown with Keith Olbermann that was in all regards exceptional. In addition to the 80 plus grandmother who was pepper sprayed and arrested at a West Coast Occupy rally he also aired the following clip with Ydanis Rodriguez were the NYC Councilman discussed his arrest, alleged beat down and 17 hour detention by the NYPD. If you did not see the clip here it is. When I locate the grandmothers interview I will post as well. Kudos to Keith Olbermann and MOXNEWS. Were fortunate to have them as an alternative media source. Labels: "Civil Disobedience", "Keith Olbermann", "MOXNEWS", "NYC Councilman Ydanis Rodriguez", "Occupy Wall Street", "Zuccatti Park"
Mark Naison of Fordham University recently forwarded the following about the accomplishments of the Occupy Wall Street movement to date. With all the misinformation and propaganda against the movement I consider it a must read. 6. Given the labor movement a new vocabulary to challenge attacks on collective bargaining and union recognition, providing added ammunition to the successful campaign to defeat an anti-collective bargaining bill in the state of Ohio. This would be an impressive list of accomplishment for a movement that has lasted two years. But Occupy Wall Street has only been with us for two months! Labels: "99%", "Collective Bargaining", "Democracy", "Economic Inequality", "Fordham University", "Keystone XL pipeline", "Mark Naison", "Occupy Wall Street"
Medicare Rights & Enrollment Event Scheduled for Thursday, November 17th at 3:00 p.m. Here is information sent by State Senator Serrano related to an upcoming Medicare seminar. The seminar should be a great way to get informed. If you’re uninsured or a senior citizen, I highly recommend you enquire or attend the seminar. programs that help pay the costs associated with Medicare. Assembly Member Micah Kellner, and Council Member Jessica Lappin. Labels: "Medicare", "NY State Senator Serrano", "Senior Citizens", "Stanley M. Isaacs Neighborhood Center", "U.S. Congresswoman Carolyn Malone", NYC Councilmember Garodnick"
Here is another small effort made by local community leaders that will make a large impact on our community. The Bronx Council on the Arts, State Senator Klein and Amtrack have joined forces to transform a graffiti riddles overpass into a canvas for emerging artists. If interested in submitting your idea for the overpass please do read on. Please note there is a January 6th deadline. MORRIS PARK, BRONX, N.Y. – State Senator Jeffrey D. Klein, (D-Bronx/ Westchester), was joined by community leaders and educators in the Morris Park community today to announce an exciting new beautification initiative that will transform blighted railroad bridge abutments into an entryway into the community. The initiative will launch as a call for students to submit artwork through local schools before January 6th 2011. Students will be asked to submit their artwork with a short paragraph describing their vision for the bridge abutments at the intersection of Bronxdale and East Tremont Avenues. Senator Klein and a panel of distinguished community, educational and artistic leaders will select four winning entries that will be recreated on the overpass walls during the spring. For years, this area has at has been a hotspot for graffiti vandalism, sending a poor message to those entering the Morris Park community. Recently, Senator Klein's office contacted Amtrak, which owns the overpass. 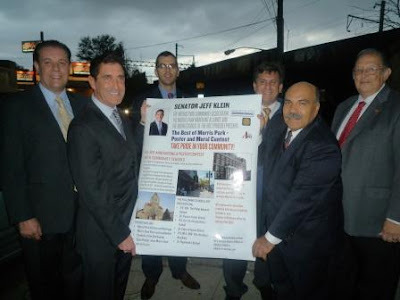 The rail line agreed to allow the wall abutments to be cleaned by Senator Klein's graffiti removal program and decorated with the winning murals. Posters can be submitted to participating schools or to Senator Jeff Klein’s District Office at 1250 Waters Place, Suite 1202, Bronx, NY, 10461. Labels: "Al D'Angelo", "Amtract", "Bronx Council of the Arts", "Dirdre Scott", "Morris Park Alliance", "Morris Park Community Center", "Peter Cohen", "Robert Ruggiero", "State Senator Jeffry Klien"
If you’re considering planting a new tree in your back yard, here is a great opportunity get one for free!!! The opportunity stems from NYC's desire to plant more trees in order to beautify our city and help keep our air as clean as possible. The tree give away will take place tomorrow and conditions do apply. If interested please do read on. Take home a free tree!! The Alliance in partnership with New York City Department of Parks & Recreation, New York Restoration Project, and Million Trees, have teamed up to offer free trees in the Bronx. Trees will be made available for individuals to take home to plant on private propety. Trees must be planted within the five boroughs and cannot be planted in containers, on rooftops, or along the street. For more information please call (718) 430-4665 or email Valerie Francis atvalerie.francis@parks.nyc.gov. Labels: "Black Tupelo", "Bronx River Alliance", "Free Trees", "Japanese Snowbell", "New York City Department of Parks and Recreation", "New York Restoration Project", "Yellow Wood", Sour Gum"